Nine Republicans vote against renaming post office after Maya Angelou. 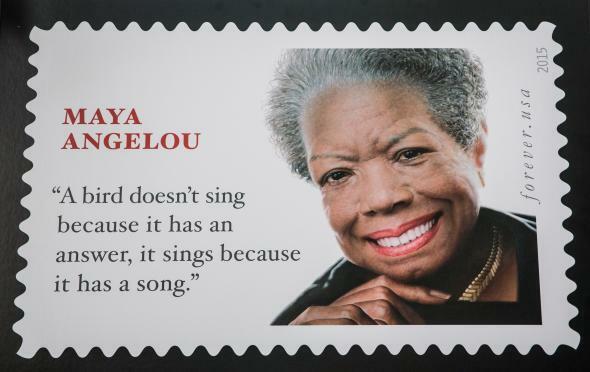 The Maya Angelou Forever Stamp is dedicated by the United States Postal Service on Aug. 20, 2015, in New York City. If you needed a break from the political rigors of the campaign trial, here’s some news from the home front on the policymaking juggernaut that is the United States Congress. On Tuesday, Congress got to the serious, seemingly uncontroversial business of naming things. To show that both sides of the aisle could still come together to name post offices that dozens of people still use to send nonelectronic mail, House members voted 381-0 to rename a California post office “Medal of Honor” post office. Sure. No one knows the name of the local post office anyway. That’s what makes it all the more absurd that in the following vote, also on the renaming of a post office, this one in Winston Salem, North Carolina, that nine Republicans voted against renaming the branch after acclaimed author, poet, and civil rights icon, Maya Angelou. Maya Angelou! Why? Here’s what the Gang of Nine came up with. [Angelou] once wrote, “Of course, Castro never had called himself white, so he was O.K. from the git. Anyhow, America hated Russians, and as black people often said, ‘Wasn’t no Communist country that put my grandpappa in slavery. Wasn’t no Communist lynched my poppa or raped my mamma.’” Her commentary aligned with Pan-Africanism and anti-colonial sentiments, according to which people of color — particularly those in the African Diaspora — identified their struggles as part of one larger, systemic fight. Democratic Rep. Steve Israel was not impressed.